When I found out about the accompanying student version of his book, I was really excited (PS- I am really annoyed with the unlinked ‘k’ but I’ve already spent a ridiculous amount of time on my formatting OCD. Carry on.). After reading it, I don’t think I could pass it through in Middle School. Though I believe whole-heartedly in sharing the truth of living and life with students at the middle grades in order to help them make decisions before they are confronted with them, I can also understand the position of our school systems in ensuring we respect the wishes and shelters of their parents. Sometime it can be hard to do this; to know what could benefit a student, but to have to dial back and be conscious of our roles in their lives as secondary to the people who are responsible for raising these children throughout their life-span. Man do we get attached, don’t we? Even so, I have been toying with ways that I can get this book and story into the hearts and minds of the educators and students in my school family. I’m thinking maybe a Donor’s Choose to purchase a copy for each staff member? A little gift to remind them how influential we really can be in the lives of our students. Sometimes the only voice that believes in them. Sometimes the only portion of their day in which there is peace and stability. 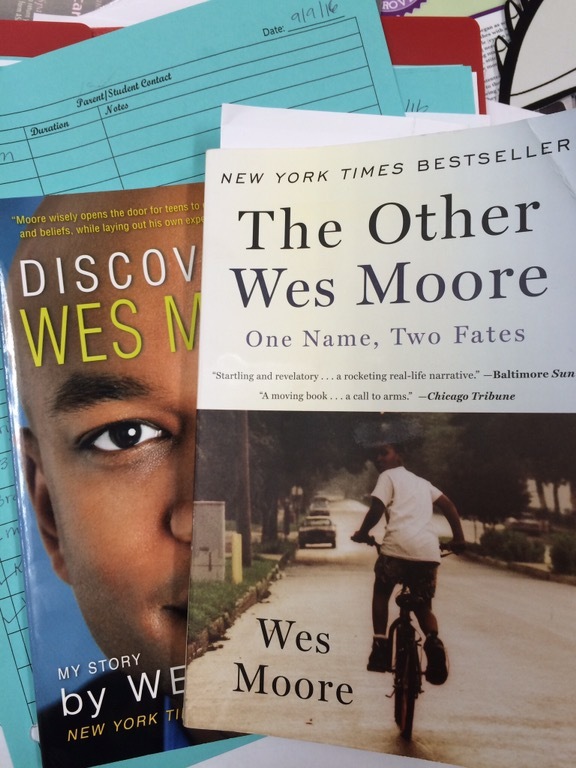 I’m also thinking about applying for a grant to have Wes Moore himself come visit the students. I just need to share-I’m obsessed! My poor principal. It also got me thinking about the characters that are accessible to our students. Wes Moore’s story will resonate with all students, but it is also inclusive of minority populations that are not typically represented in this exceptional light of success. Not because they are not out there, but because those are most often not the characters that are given recognition and reinforcement. I’m finding (through reflecting on my own education and the really superb training I get in my division) the need to make these stories available to our students. Young successful black men, strong-willed women, uniformed mentors of all colors- if society will not give our children their exposure, we have to, in education, make it our mission. Man, I am really in my feels tonight. This can only mean I’ve been reconnected with my kiddies and am feeling my profession. So good, for real. Read it! Posted in School Counseling, Sweet Links and tagged books, education, good books, high school, inspiration, middle school, read, School Counseling, school wide programs, Wes Moore. Bookmark the permalink. Such a busy year! 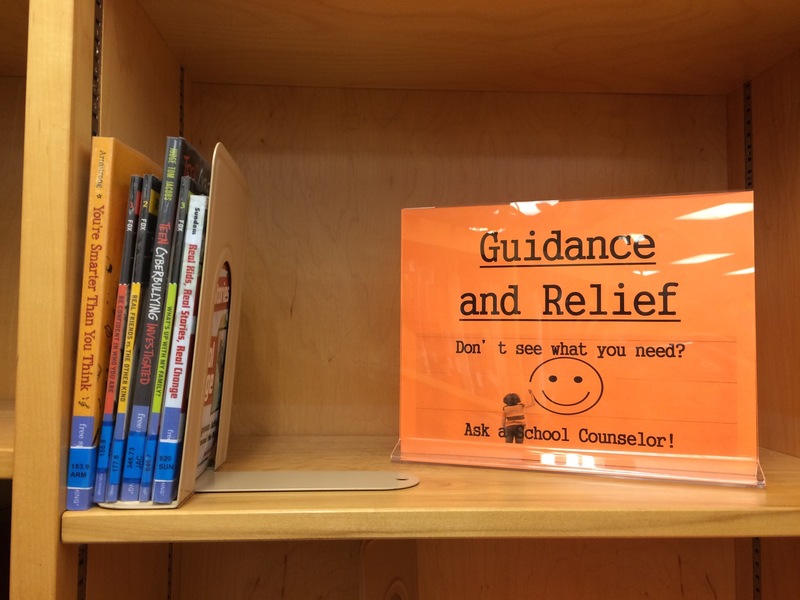 We have started a new section in our library- so exciting! We ordered a bunch of books through ﻿Free Spirit Publishing with the remainder of our services budget. I’m in love with their books because I think they do a great job of writing in a way that is in touch with all ages of students. It’s really hard to find books for middle schoolers that aren’t too young or too old in content and verbiage. Small now, but I love the idea of having a place to bring students to suggest something that might help them. We have even talked about hiding small notes in the books to brighten the day of the reader. Adorbs! We are also gearing up for the testing season. This always crazy, hectic, stressed-out time is ripe with counseling opportunities to calm down students and get them in high confidence mode. As much as we try to seperate the school counseling profession from the dry necessary, political growth mindset centered scored standards, I try to remind myself that it is a reality for students. School Counselors can really change the overall environment during testing to be positive and productive, easing students’ anxiety and helping them realize their potential. One of our counselors bring in Pom-poms and cheers for her students as they come in, one of our teachers gets donated fruits so students can have a bite to eat. These small things make such a huge difference. I like to go to each classroom in the morning and spread a little cheer by telling students they should smile because it has been shown to increase test performance (I’m pretty sure I read this somewhere, but in all actuality I have no idea). My principal shared the Larry Bell testing strategies and they really make sense. It breaks down the processes of testing very well. He encouraged us to find ways to make sure the concepts are part of our students’ everyday language- I took that to heart with a bulletin board project meant to trick students into learning about the 12 steps…when in Rome, right? 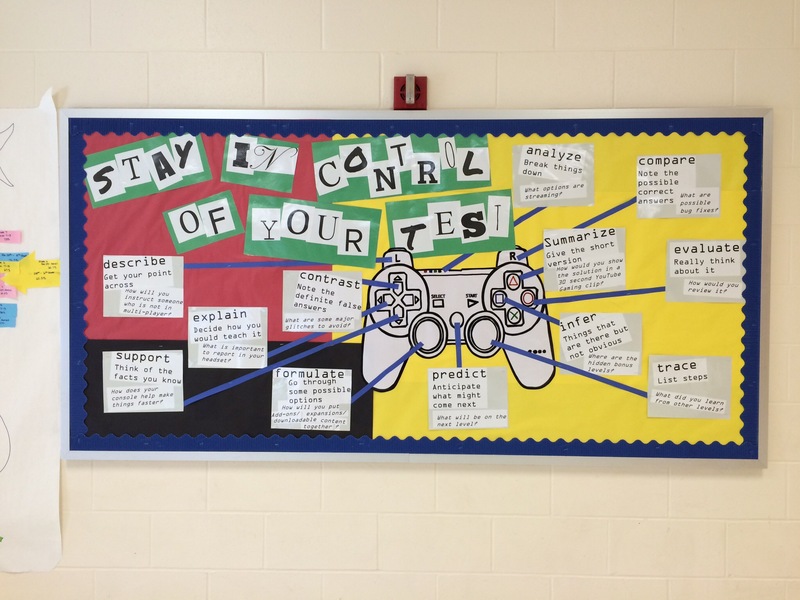 Posted in School Counseling, Sweet Links and tagged books, bulletin boards, education, elemantary school, middle school, School Counseling, testing. Bookmark the permalink.